"In the year 2035, Earth is attacked by aliens — hostile Xenoborgs who selected our planet as the next addition to their galactic empire. In mere days, man's conventional forces are destroyed, and the earth is overrun by alien troops. Now, Earth's only hope lies with the CYBORG COMMANDO Force (CCF) — a cadre of super-soldiers who are part human and part machine. With their state-of-the-art defenses and built-in weaponry, the CCs may yet be a match for the invaders. But time is running short! * A 16-page adventure booklet packed with beginning scenarios." ""Attention all units! A huge Xenoborg strike force is in space above your area. All resistance forces must evacuate immediately. CC operatives must stop this force from landing!" In this adventure, the characters are assigned to contact Major MacDonald, leader of a group of resistance fighters in southern Indiana, and secure his cooperation with the CCF. They must also deliver a new microwave device for cleaning up Xenoborg remains. But once they arrive, the situation heats up - the Xenoborgs have brought in reinforcements! With the help of a human traitor, they have captured several civilians, and plan to execute them on the six o'clock new unless the resistance fighters surrender. Once the execution has been stopped, the characters must locate the Xenoborg camp where the remaining hostages are being held. And there they find an even bigger threat - an Aerial Teleborg and its Xenoborg Captain! 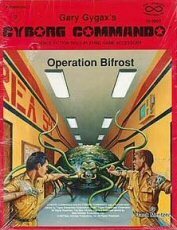 This booklet includes six ready-to-play characters (with both Basic and Advanced stats), maps of post invasion Indiana and Illinois, and a detail map of a Xenoborg camp. 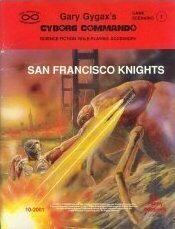 This is the second adventure for Cyborg Commando Game by Gary Gygax, Frank Mentzer, and Kim Mohan. You will need the game to use this accessory. This hard-science game is set fifty years in the future. In the year 2035, alien invaders conquer the Earth in a matter of days. Man's only hope is the Cyborg Commando Force - a cadre of super-soldiers who are part man and part machine. 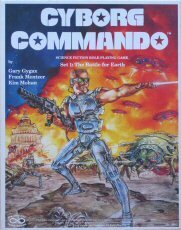 Pick up a copy today and join the Cyborg Commando Force!" "In 2024, at a small research base in Virginia, Project Eggshell (the work of Richard Sawtell and Dr. Nkruma Kotusu) produced the first Cyborg Commando unit. After the CC Force was founded, Sawtell left to further his own work. Kotusu pursued his dream of using the hybrid of mechanical body and brain as super-armour for normal soldiers. When the Virginia centre was truned over to him, it was secretly redesigned and named Asgard - the abode of the gods in Scandinavian myth. During the alien invasion, Asgard was apparently destroyed, and Kotusu lost. But now, six months later, an ultimatum has suddenly been broadcast from the ruins, warning the Xenoborgs to leave the planet - or else. Kotusu is alive, and either he has developed the most powerful weapon ever devised, or he's gone crazy. And the Cyborg Commano characters mhst break into the depths of their own top-secret complex to find out which... This booklet contains background notes on the events leading up to the adventure, and full details for the GM on the large underground complex called Asgard. Kotusu's latest innovation (the Type-3 CC) is described, and a new, very alien creature is introduced. Also included are official new game rules on field repairs, fixed attacks, character death, and ultraspeed. 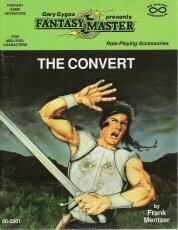 This is the third adventure for the Cyborg Commando Game, created by Gary Gygax, Frank Mentzer, and Kim Mohan. You must have the game to use this accessory. The CC Game is set less than fifty years in the future, in the year 2035. 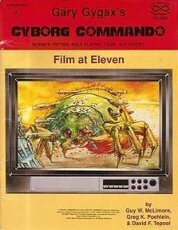 Alien invaders conquer the Earth in mere days, and man's only hope is the Cyborg Commando Force - a cadre of super-soldiers part man and part machine." What turned the Prince into... THE CONVERT? Capital City is happy, prosperous, and secure — until the king's son returns home after a long adventure. His new beliefs become new laws, and the trouble that results might destroy the kingdom. The characters, fleeing for their lives, must find out what really caused the Prince's conversion, and restore his sanity before the kingdom falls. The Convert features both wilderness and dungeon adventuring, with details on two non-human societies. It was originally used in 1985 as a major tournament at the world's largest gaming convention. And now this fully revised and updated edition is available for you to use at home. Do you usually avoid "off the shelf" adventures? Do you make a lot of changes in the modules you do purchase? Then FANTASY MASTER game accessories are for you. In every FANTASY MASTER game accessory, your needs come first. Looking for the best? Look to New Infinities." "Of the many fantasy role-playing scenarios produced each year, most are barely adequate, some are exciting, and a few prove to be innovative and challenging. 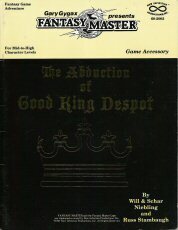 The Abduction of Good King Despot is, I believe, one of those rare classics — the exception to the mass of dull material offered in bright packages to module-weary game enthusiasts each year. I first had the happy experience of playing this adventure at a game convention many years ago. Afterwards, I obtained a copy of the scenario and carried it with me whenever I thought there might be an opportunity to GM for a new group. "The good king has been abducted! The kingdom has lost its benign, honest, and charitable ruler (at least that's what he said he was, and the dubious, tax-crippled citizens found it prudent to agree). Despot's good queen cannot be consoled, though she tries very hard to find comfort. At last, the truth emerges: the good king is being held in the magical prison of the arch-fiend Ignax. And a party of brave adventurers will, of course, get the unenviable task of digging him out — perhaps even literally. Those bold souls who undertake this rescue mission will quickly discover that Ignax's warped mind has created the zaniest dungeon setting they have ever experienced. The characters will encounter weird (though dangerous) monsters, strange traps and devices, brutally cryptic clues, and utterly mystifying situations. Only a group with imagination, intelligence, bravery, and an indomitable sense of humor will be able to restore the king to the arms of his loving wife. The Abduction of Good King Despot includes a 32-page text booklet, a 16-page booklet of black-and-white illustrations, and a color map of Ignax's wacky dungeon."